A couple of weeks ago, we went to New York City for the weekend to celebrate our second wedding anniversary. Why NYC, you ask? Well, we wanted to be tourists for a change. Seeing as how we have friends and relatives around the area, we have never stayed in Manhattan, at a hotel, just the two of us. Instead of trying to make the last bus to Jersey or catching a late train back to Queens, we were on our own schedule, absorbing the sights and sounds of the Big Apple like we had never visited before. We saw a show on Broadway (Memphis – which was outstanding), walked the entire length of the High Line, and frolicked around Central Park… the whole nine yards. And then of course, there was the food. 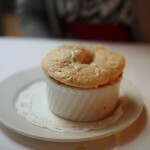 I surprised Rachel that Saturday night with dinner at one of the city’s top restaurants – Eleven Madison Park. One of the toughest tables in NYC, their reservation system is very similar to that of Minibar: you can only make a reservation exactly 30 days to the date starting at 9am (Jose Andres’ phone line opens an hour later, but I digress). 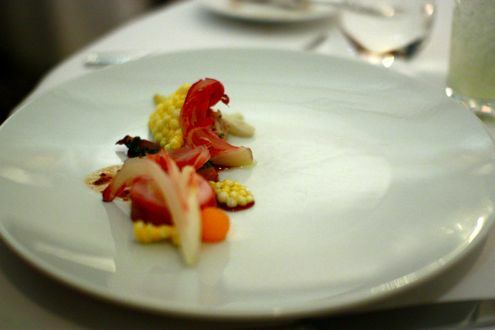 However, Eleven Madison Park also takes reservations not only by phone but also via OpenTable, which made things a lot easier. While vigorously pressing the F5 key, I grabbed whatever slot was available. As soon as the clock struck 9, a 6:15pm table for two soon showed up. I clicked, and it was booked. Certainly beats hitting the redial button 100 times. Patting myself on the back, I had to keep our reservation a secret for an entire month. Fast forward to March 3rd. We grab a cab from the hotel and make our way down towards Madison Square Park. Rachel still has no idea where we’re going, and when we arrive, she admits she has never heard of it before. Nonetheless, the friendly host greets us at the door, takes our coats, and congratulates us on our anniversary while showing us to our table. The sommelier then comes over and hands me their wine list while providing Rachel a menu of “soft cocktails”. You see, Rachel is… well, you guessed it (surprise! 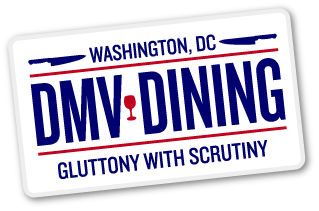 ), and I gave the restaurant a heads-up when I originally made the reservation. 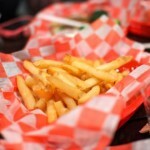 We were already wowed by the service with that gesture, and we hadn’t even ordered anything yet. Then comes their fascinating menu concept – the meal is set up as a four-course tasting menu, but the menu lists 16 main ingredients arranged in four rows of four. Diners choose one main ingredient from each row which represents that course, and each dish revolves around said ingredient. For example, the first row had a choice of hamachi, octopus, fois gras, and sunchoke. Needless to say, but we have never seen anything like this before. No descriptions, just the name of the ingredient. 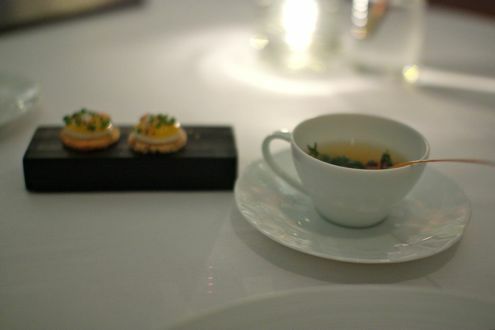 And despite that the menu lists only four courses, the restaurant also provides an array of amuse bouches and small plates along the way. 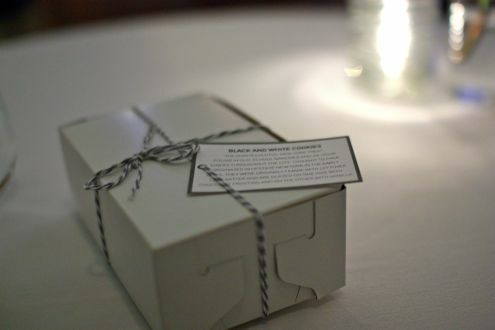 For instance, the meal started out with the kitchen’s take on a New York staple, the black and white cookie, served in a wrapped box. 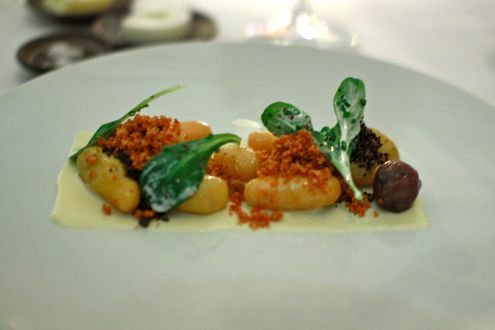 This rendition, however, was savory and comprised of parmesan and black truffle. From there on out, we knew we were in for a memorable evening. We then received a cup of smoked apple-thyme tea accompanied with a sunny side up quail egg on toasted brioche with applewood smoked bacon. 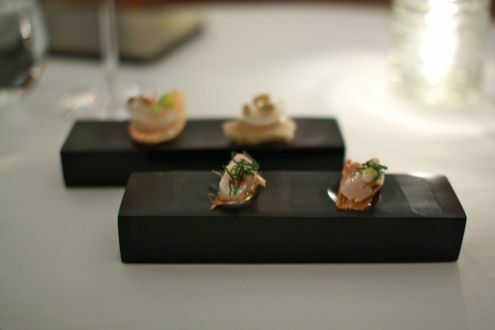 Our next amuse bouche was a mackerel and scallop crudo. Unfortunately for Rachel, she was unable to have it since she obviously has to avoid raw fish, but the waitress was very accommodating and offered to bring her a cooked version of it. She returned with a new plate within a matter of minutes, leaving Rachel and I very much impressed by the outstanding service. 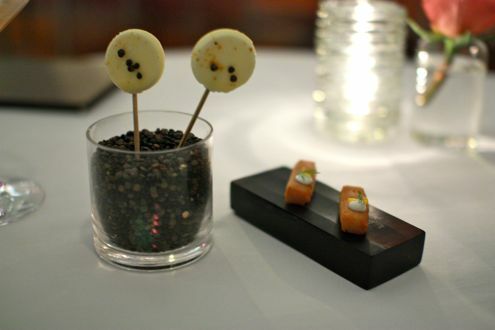 Our fourth and final amuse was perhaps the most impressive – frozen Greek yogurt lollipops with curried lentils, as well as a plate of panisse (chickpea fritters) with yogurt. Yes you read that correctly, frozen Greek yogurt lollipops! We were then served a pair of their croissant rolls, which were accompanied by fresh cow’s milk and goat’s milk butter. The goat’s milk butter was irresistible as we both kept spreading it across the warm, flaky rolls. They reminded us of the ones you can find at Fiola. After a wonderful array of small plates, we then began our first course. Rachel ordered the octopus, which was poached and prepared with chorizo, onions, and lemon. 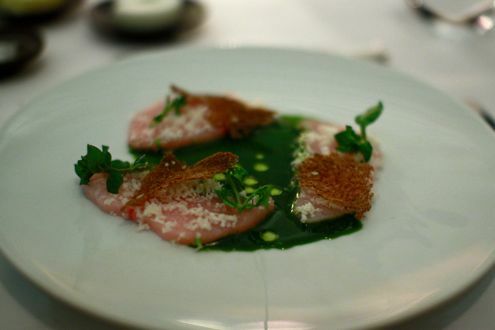 I went with the hamachi, which was marinated with horseradish and peppercress. It was a lovely piece of yellowtail. For our second course, Rachel ordered the lobster. 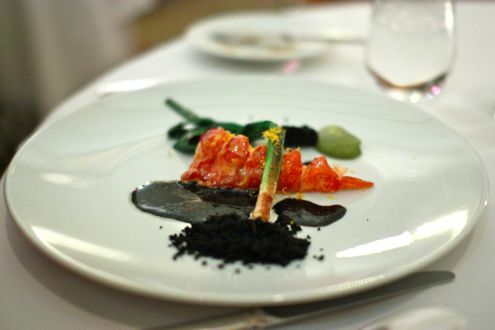 The beautifully presented plate featured poached knuckle and claw meat with Meyer lemon beurre blanc and was accompanied with charred leek, leek puree, charred bay leaf, and dehydrated squid ink. The lobster was impeccably poached in the lemon sauce and each bite was heavenly. 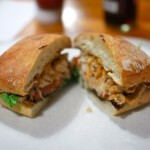 Amazingly, the charred bay leaf had the flavor of toasted bread. I, on the other hand, decided to be a little adventurous and opted with… a vegetable? Seeing as how I typically stick to proteins, I’m very much a fan of potatoes and felt that the kitchen could wow me with such a simple ingredient. 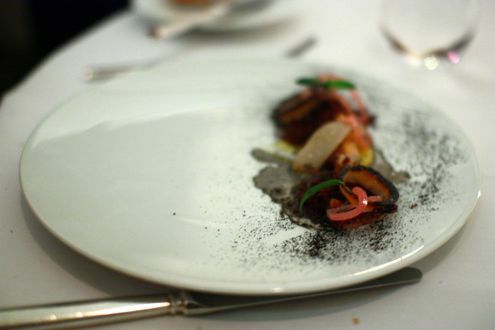 The plate featured several smoked miniature potatoes on a bed of potato puree, topped with bacon crumbles and black truffle shavings. It was good, but I was definitely eyeing Rachel’s lobster for a good duration. It was then onto our main course. Rachel ordered the rabbit, which was prepared two ways: loin wrapped in pancetta, and rabbit rillette. It was accompanied with mustard seed au jus, endive, and fried tapioca balls. Now Rachel isn’t one to normally order something like rabbit, but she thought she’d try something different, and it was certainly of the most unique dishes she had. I ordered the beef, which turned out to be a 55-day dry aged rib eye. 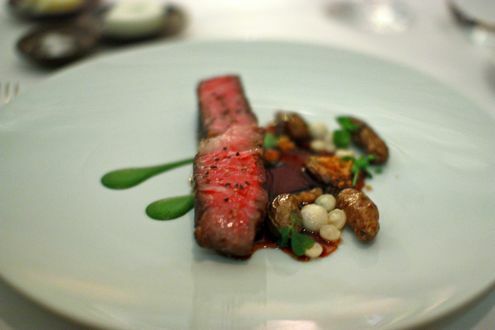 It was an exceptional piece of steak, prepared medium-rare and delightfully tender. Lightly drizzled with sorrel sauce and served with picked mushrooms, it wasn’t the largest cut of beef but it was satisfying nonetheless. 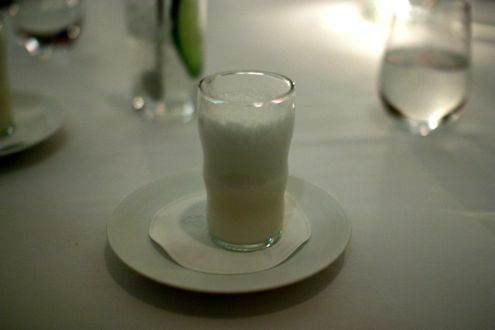 Just when it couldn’t get any better, our next course was the restaurant’s take on another New York classic — egg cream. Prepared tableside, our waitress mixed whole milk infused with cacao nibs, orange syrup, and seltzer poured from a classic soda siphon. We loved every second of it. Then came the deconstructed New York cheesecake. 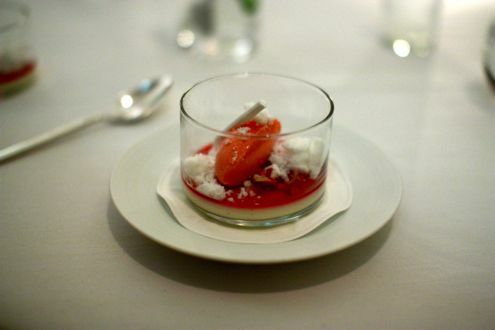 Prepared with goat cheese and situated in a glass with blood orange sorbet while topped with vanilla “snow”, this dessert was simple divine. Oh, and we hadn’t even got to our actual dessert course yet. Speaking of which, that came next. I ordered the chocolate dessert, which was a combination of sweet and salty. 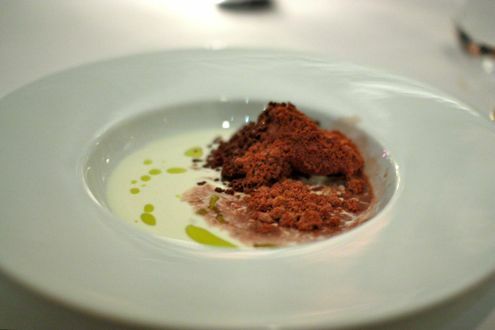 It featured crunchy mounds of chocolate atop of layer of crème, lightly drizzled with olive oil. 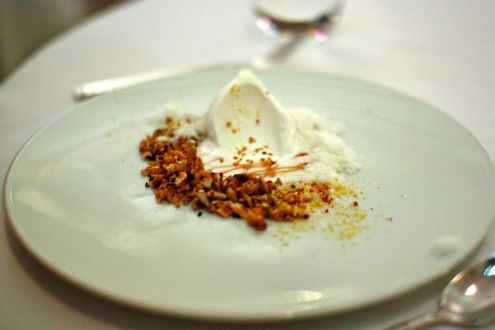 Rachel went with their renowned “milk and honey” dessert, which featured milk sorbet with a honey center, dehydrated milk foam, and milk snow. 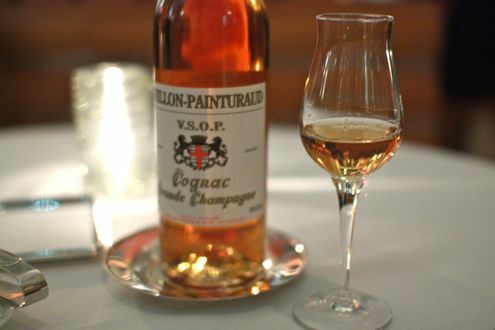 Our waitress soon came by pouring me a glass of cognac, leaving the bottle at the table in case I wanted to refill it. Yeah, they left us alone with the entire bottle! The restaurant was probably fortunate in that I’m not a huge fan of cognac, so the bottle was left untouched, but still, that’s one incredible gesture. And of course they one-upped themselves by serving Rachel a glass of sparkling cider so she wouldn’t feel left out. 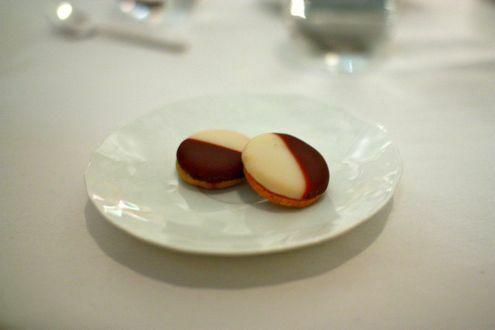 And to top things off, the meal ultimately concluded with black and white cookies, but this time they were actually sweet, prepared with vanilla, chocolate, and lemon. A fitting end to a fabulous meal. Just when we thought we were done, they not only handed us a jar of granola to take home for breakfast, but also gave us a box of chocolates with a “Happy Anniversary” insert placed inside. Talk about leaving your customers with an everlasting impression. Chef Daniel Humm even stopped by our table to say hello. 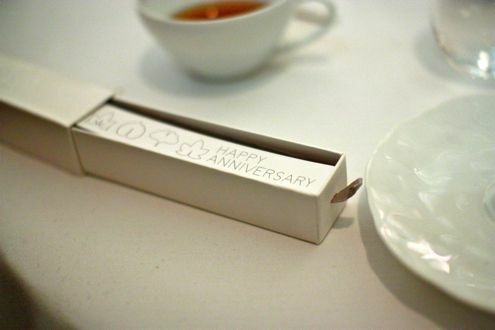 The staff at Eleven Madison Park went above and beyond and truly made our anniversary a memorable one. 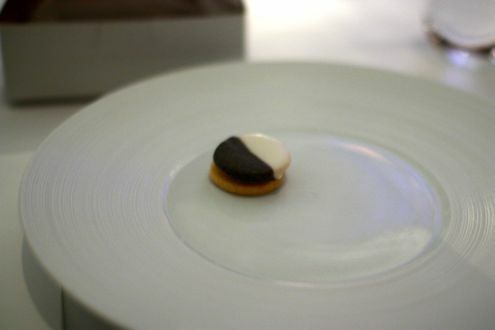 If you’re ever in the city for a special occasion, Eleven Madison Park is highly recommended.